We’re so excited to introduce everyone to Heidi Eckerson, the newest member of our team at the Alternatives Library. 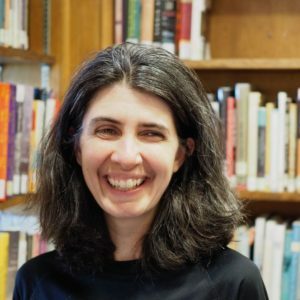 She brings a spark of energy and passion to the library’s collection – and it’s likely that you’ll be interacting with her when you visit the library or reach out with any questions about the collection. R : What was going on in your life that brought you to join the Alternatives Library team? H : I’ve been a DAL patron for a little bit and loved the collection and the space. I remember thinking ‘it would be so amazing to work here’. I’m finishing my Masters of Library and Information Science degree this fall and when I saw the post I had to throw my hat in the ring. All libraries are near and dear to my heart, but this one is especially so because of the nature of our collection. DAL is unique in that it is a public library (with free access to all) on a university campus. It’s a beautiful synthesis of these two worlds. R : What does alternatives mean to you? H : Choice. Possibility. Potential. That there is more than just one way to do, be, see, hear or otherwise experience something or ourselves. R: What has surprised you about the library so far? H : The library’s collection informs projects that DAL supports and projects inform the library’s collection. It’s really quite a beautiful relationship. I was also curious to learn about the significance of the Durland logo–a dandelion. It’s a great story that we’ll share in an upcoming blog post. R: Anything else you’d like to share with us? H: While our collection is small, it is mighty and contains a variety of resources that are not typically found in other libraries. I am excited that the library is a place for connecting and collaborating for all–both in person and through our collection. Come visit us–we are a public library (free access to all!) with an indie bookstore feel. DAL is a hidden gem in Ithaca.